Denbighshire (Welsh: Sir Ddinbych) was one of the thirteen historic counties of Wales. It was a maritime county, bounded to the north by the Irish Sea, to the east by Flintshire, Cheshire (England) and Shropshire (England), to the south by Montgomeryshire and Merionethshire, and to the west by Caernarfonshire. The county was created following the Act of Union of 1535, between Wales and England, and was formed from the cantrefi (hundreds) of Rhos; Rhufoniog; Dyffryn Clwyd; IÃ¢l; Nanheudwy; Cynllaith and the Maelor Gymraeg which were formerly in the Welsh kingdoms of Gwynedd and Powys Fadog. 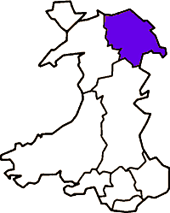 The administrative county of Denbighshire, with an elected county council, was created in 1889 by the Local Government Act 1888. The county was governed by an elected county council, who took over the functions of the Quarter Sessions courts. The county town was Ruthin and other main towns were Wrexham and Denbigh. Under the Local Government Act 1972, the county and administrative county of Denbighshire were abolished, for both local government and ceremonial purposes, on April 1, 1974. 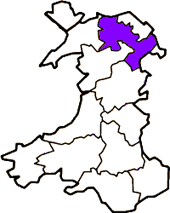 Most of Denbighshire becoming part of the newly formed county of Clwyd covering the whole of north-east Wales. 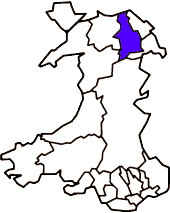 However, the urban district of Llanrwst and five rural parishes, became part of the newly formed county of Gwynedd. The county town was Mold. Following further reorganisation under the Local Government (Wales) Act 1994, the administrative county of Clwyd was abolished on 1 April 1996 and the present-day county of Denbighshire was created. This covers a substantially different area from the historic county of Denbighshire however. The county town is Ruthin.